Cooking outdoors over an open flame has been popular ever since our prehistoric ancestors discovered fire. And those flames are still going strong today. In fact, it’s more popular than ever. Three out of four U.S. adults own a grill of some type. Luckily for us, our outdoor cooking options and types of outdoor grills have come a long way since those early cave dwelling days. Are You Ready To Start Looking For An Outdoor Grill Or Barbecue? With so many styles and types of outdoor grills on the market, it’s hard to know how to choose the right one. However, breaking them down into the six main types of bbq grills will help make the decision-making process that much easier. Gas Grills are the most popular type of backyard grills in the US. In 2016, Gas grills outsold charcoal grills, 57.7% to 40.1%. 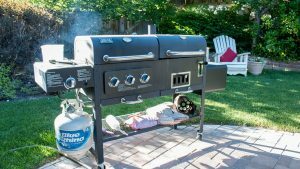 Gas Grills use either propane or natural gas and provide the speed and convenience that many of us are familiar with nowadays. With the simple push of a button and twist of a dial, you can be ready to cook. 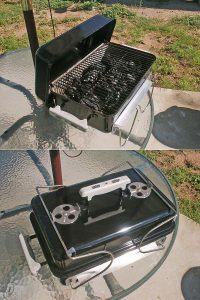 They heat up and clean up quicker and easier than charcoal grills. It’s easier to regulate heat more precisely by using temperature control knobs. Creating heat zones for keeping food warm, searing or direct cooking is easily done with gas grills. The more popular type of gas grills is freestanding units that usually feature wheels for movement with doors or drawers for storage. Propane Gas Grills – Designed to run off of a portable propane tank that can easily be stored and refilled. A 20-pound tank, (which is usually standard,) can last around 25 hours of grilling time. Natural Gas Grills – Natural gas grills are generally less expensive than propane grills. They do require a natural gas line from the house to the grill to be installed making them immobile. Infrared Gas Grills – With their energy efficiency, high heat performance and easy cleanup, Infrared gas grills are slowly becoming one of the more popular gas grill options on the market today. 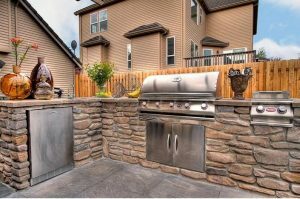 Built-In Gas Grills – Perfect for planning the ultimate outdoor kitchen. These gas grills are meant to be the centerpiece of custom built grilling islands perfect for entertainment and convenience. Portable Gas Grills – Designed for mobility and convenience, portable gas grills are for the griller on the go. Using smaller, portable propane tanks, they are perfect for camping trips, tailgating or family cookouts in the park. Charcoal Grills are the original grills. They are a classic for sure. Grilling purists say that charcoal is the only way grilled food should be prepared. This low-tech grilling method is hard to beat for authentic cooked outside flavor. They can burn natural hardwood, charcoal briquettes, lump charcoal, wood chips or a varied combination of those four. Charcoal grills produce that natural smokey flavor and goodness that we instantly imagine when we think about good barbecue. If you’re planning on investing in a charcoal grill, be prepared for slightly longer prep and cooking times then when grilling with gas grills. Clean up is messier when dealing with coal ash as well. However, in my opinion, the payoff is better tasting, authentic BBQ. Traditional Barrel Charcoal Grills – Barrel Charcoal Grills are grills that resemble a steel drum barrel that was sliced in half lengthwise. The top half forms the lid and the bottom holds the charcoal. Charcoal Kettle Grills – Kettle grills are considered the classic American grill design. They combine a lid, cooking grid, charcoal grid, lower chamber, venting system, and legs. The bottom chamber that holds the charcoal is shaped like a kettle, giving the grill its name. The kettle design helps distribute heat more evenly. Kamado-Style Charcoal Grills – Kamado-Style Grills are traditionally of ceramic construction. They are more versatile than most other charcoal grill designs as the ceramic construction retains heat and moisture more efficiently. They are equally at home while barbecuing, smoking or grilling foods. 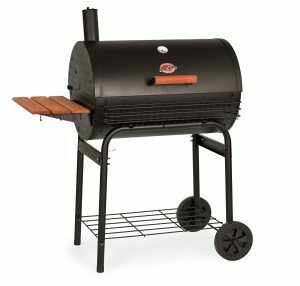 Charcoal Smokers – Although you can smoke food on most all styles of charcoal grills, these Charcoal smokers are specifically designed for smoking only. Some are bullet shaped or Vertical Box shaped. Wood Pellet Grills are slowly becoming one of the fastest growing trends in the outdoor cooking industry. Their popularity is surging and for a good reason. They are able to give you the flavor of wood smoke, with the turn of a dial convenience of a gas grill. 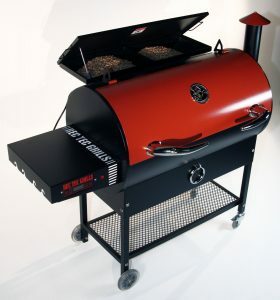 Wood Pellet Smokers have even become popular in BBQ competitions, and they have been winning top prizes at many of them. 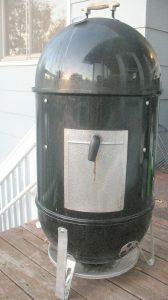 Out of all the many smoker designs on the market today, electric wood pellet smokers are the simplest to use. They are thermostatically controlled, just like your kitchen oven. You pick a cooking temperature, and the built-in controller will sustain it by feeding pellets into a fire pot as needed to maintain your chosen temperature. They have the ability to bake as well as smoke and grill with their electronic control panel that automatically feeds pellets to the fire. They regulate airflow and help maintain consistent cooking temperatures. 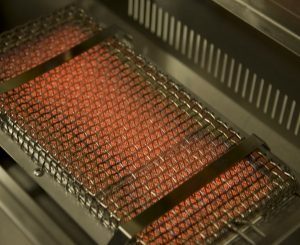 Many pellet grills also use sophisticated sensors for more precise temperature control. 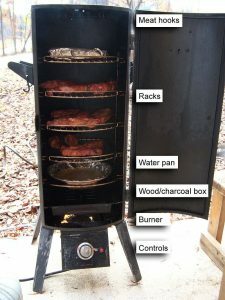 Food Smokers are specifically designed to infuse food with wood smoke flavor. Smoking food has been around since the primitive caveman and was a way to change the flavor and better preserve the food. Today, we mostly smoke food for added flavor alone. Smokers come in a variety of different styles and sizes. Charcoal Smoker – Although you can smoke food on most all styles of charcoal grills, these Charcoal smokers are specifically designed for smoking only. Some are bullet shaped or Vertical Box shaped. Offset Skomer – Traditional Offset Smokers have cooking chambers that are cylindrical in shape. A smaller diameter cylinder chamber is attached to the bottom of one end which is used for the firebox. A fire is built in the fire box chamber where the airflow is controlled. The smoke and heat from the firebox are drawn through an opening into the cooking chamber infusing and cooking the food. 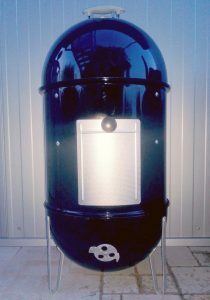 Upright Drum Smoker – The upright drum smoker (also referred to as an ugly drum smoker) looks exactly like you would expect from the name. It is an upright steel drum that has been tweaked for the purpose of indirect heat hot smoking. They usually consist of a steel drum, a basket that holds charcoal near the bottom and a cooking rack or racks close to the top with a vented lid. 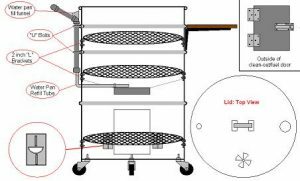 Vertical Water Smoker – Vertical Water Smokers (also called bullet smokers because of their shape) are a variation of the upright drum smoker. The bottom is loaded with charcoal or wood for smoke and heat with a water bowl in the middle are between the fire and cooking section. The water bowl helps to create optimal smoking temperatures while adding humidity to the smoke chamber. Smoke Box Smoker – Smoke Box smokers are usually a two box system which is stacked or adjacent to each other. The amount of heat from the fire box can be contained to a finer degree. The heat and smoke from the fire box are sent into the food cooking box. 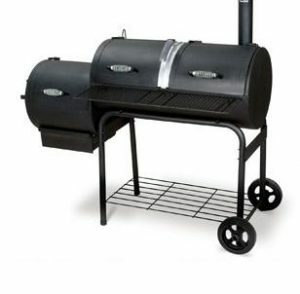 Propane Smoker – A propane smoker helps to smoke food in a more controlled environment. The big differences are the smoke and sources of heat. The is created by a gas burner placed directly under an iron or steel box. This box contains the wood and charcoal that provides the smoke. The steel box only has a few vent holes on top. The box starves the heated wood of oxygen making it smoke instead of burning. Electric Smoker – Wood Pellet Smokers are slowly becoming one of the fastest growing trends in the outdoor cooking industry. Their popularity is surging and for a good reason. They are able to give you the flavor of wood smoke, with the turn of a dial convenience of a gas grill. Out of all the many smoker designs on the market today, electric wood pellet smokers are the simplest to use. Today more than ever, there are some really great outdoor electric BBQ grills that can cook up both veggies and meat to near perfection. Touted as a healthier way to cook, they work very well, are low maintenance, and they make some great tasting food. They are a great option for people who live in complexes that do not allow gas or charcoal grills due to fire codes. The balcony barbecuers of the world should take note. Electric Grills are generally more compact and sleek in design and appearance. They run off of electricity and provide a high heat alternative to gas and charcoal. Most are safe to use both indoors and out and have many benefits compared to gas or charcoal grills. They are easy to clean, safe and provide an even cooking temperature throughout. Portable Grills are small and lightweight and are often used for tailgating and camping. Being quite compact making them easier to transport, they are a popular option. They are usually either a miniature kettle or tool box like shape. Often the legs will fold up over the lid locking it in place. 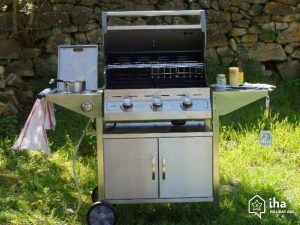 Portable Propane Grills – Most portable Propane Grills come with small camping size cylinders of propane to fuel and cook the food. They can also be modified with a conversion kit for a 20-pound propane tank if you will be on an extended camping trip. 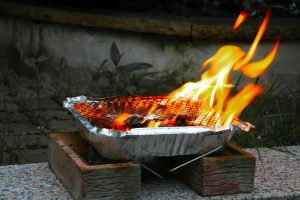 Portable Charcoal Grills – Portable Charcoal Grills are perfect for the barbecue purist while grilling on the go. They are lightweight and easy to transport. Clean is as simple as removing the cooking grate and shaking the ash into a safe container for disposal. Easy to use and set up. 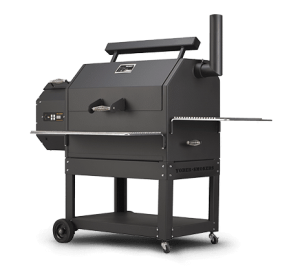 Dual Fuel Grills offer the convenience of gas grills with the added flavor and experience of charcoal grilling. All from one grill. Short on time and want the food on the table in a hurry? It’s as easy as the push of a button and the gas grill is ready to go. Want the experience, smell and flavor of charcoal and wood smoke? Make up a bed of hot coals and grab your favorite beverage. Having the whole family over for a backyard cookout? Light up both sides of the grill and become a grilling master. The Outdoor Disposable Grills are a newer phenomenon made popular in Europe in the early 2000’s. They are small and lightweight and meant to be used for a single application. When you have finished cooking, the grill is either recycled or disposed of. These grills are self-contained and come with everything needed for grilling the food. They include a foil pan filled with charcoal, grill top (grate), starter sheet and ignition fluid. Some include a small stand. These are great for a variety of uses such as tailgating, picnics, beach parties, camping and more. As always, if you find this information on the different types of outdoor grills informative, please consider sharing it with your Grilling friends! I hope you’ve enjoyed my guide to the many types of outdoor grills and it proves helpful to you. 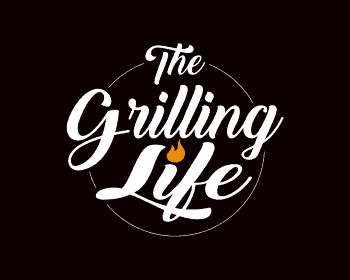 I also hope that you are one step closer to joining me in “The Grilling Life”! It was amazing reading this article on roasting grills. I’m reminded of the traditional three stone firewood cooker that my mom used when I was growing up. I like the modern technology and what it has to offer. I love camping and I’ve many options in terms of portable grills. One of my favourite meals during camping is roasted meat and you have given me many varieties of grills to choose from. I love the gas infrared grill because of the way it’s designed. The charcoal burner grill is more traditional to me although charcoal is more scarse these days. 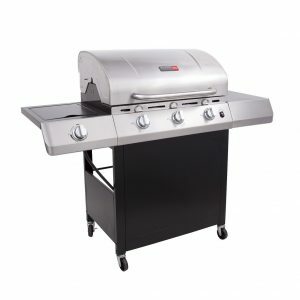 I’m looking for a more economical grill that would use solar instead of gas and electricity. I’m sure this would be a good Christmas gift for my mom at the end of the year. Do you have any suggestions for a solar roaster grill? Things have definitely come a long way, Paul. 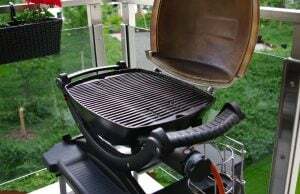 From portable grills for camping to awesome porcelain charcoal grills that are outstanding at holding heat and staying light for long periods at a time, to super luxury gas grills with all the frills, the choices are endless. This includes Solar Grills. There is actually such a thing now. I have never used one but I am familiar with them through my many years of research. One of the better rated solar grills on the market are the GoSun brand solar grill barbecues. Here is another link for a video on how they work. http://www.geek.com/news/gosun-solar-grill-barbecues-without-fuel-even-at-night-1622001/ They are pretty cool if you ask me. However, I love the built in look of the gas grill that is pictured in this post. If I ever have the money to invest in an outdoor grilling area like that, I just may convert. I also enjoy the idea of the outdoor fireplace but the cost of one is outrageous. I just may have to come up with a design for an outdoor grilling area where the Weber grill is built-in. Not sure if it will look as nice but I could always convert a gas grill to a charcoal, I guess. Thanks for sharing this article it is very informative! I am with you, David. I use charcoal 75% of the time and it is my preference for great tasting BBQ. The few extra pounds comes with the territory. 🙂 Outdoor grilling stations are becoming more popular by the day. They are a great way to spend time with family and friends and they really look great too. I have been planning mine out in my head for years now and am finally about ready to start building it. I am going to set up both a gas and charcoal section, but you can have them built however you like. Here are some examples of charcoal grilling stations that you may like for ideas. I really enjoyed this set of outdoor charcoal stations Patrick! I the Fall scene with all the leafs is my favorite. Mainly because it has a roof over the outdoor kitchen area. If I ever get rich I will build it and have you over for some steaks my friend! My fingers are crossed you hit it big David! Thanks for stopping by. I absolutely love grilling! It’s a part of the summer the same way than swimming and enjoying the sunshine is. Sitting outside by the sea in the evening once the air starts to cool down, with some wine and grilling and smoking fish together with the whole family is one of the fondest memories from the childhood. I have tried gas, pellets and electrical grills, but nothing compares to charcoal or wood grills! I have a portable char goal grill and smoker that I can take with me to beach, just in case we manage to catch some fish. I couldn’t have said it better. Grilling is definitely a big part of summer for many families and always brings back great memories of past cookouts for me as well. There is something to be said for each type of grill and there is a time and place for all. Hopefully, fishing will be good for you this year and your portable charcoal grill gets a big workout. Cheers! 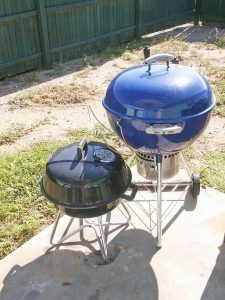 This is the most thorough and informative article I’ve found runnig through the relative pros and cons of various types of grills, thank you! I’ve always loved using charcoal, I guess I’m old school like that although it does mean due to prep time I only ever grill at weekends. This combined with the fact I now have 2 mini wrecking balls in the shape of young children running around means I’ve found myself cooking outdoors less and less. I think I now need to make a change and get something affordable, low maintenence and quick and easy to use. I had never even thought of electric until I read this – are there any brands/models you think I should check out? If you are interested in checking out electric grill options, take a look at a few here. If you need more info or are looking for something else, feel free to email me and I will be happy to help.